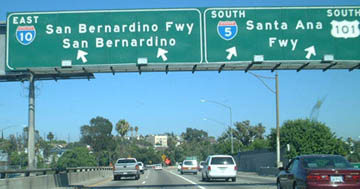 US 60-70 ended there, but US 99 continued to the left with northbound US 101; southbound US 101 was to the right. 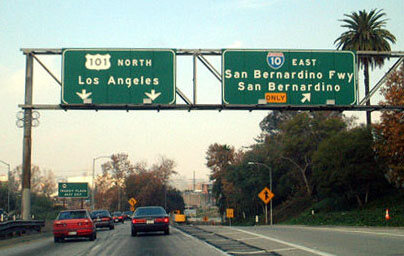 That was looking roughly north; the expressway coming from the bottom and curving off to the left over the Los Angeles River is modern US 101. 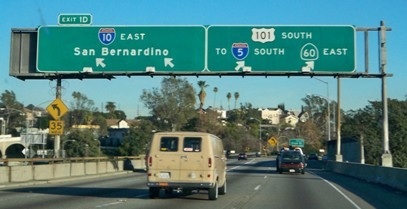 The expressway coming in from the right is the San Bernardino. 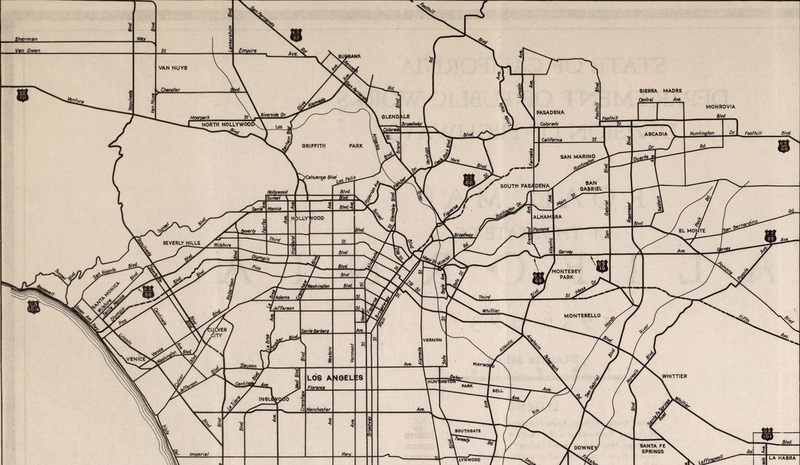 So that interchange marked the west end of US 60-70 for another 10 years or so, until those routes were truncated out of Los Angeles in the 1960s. 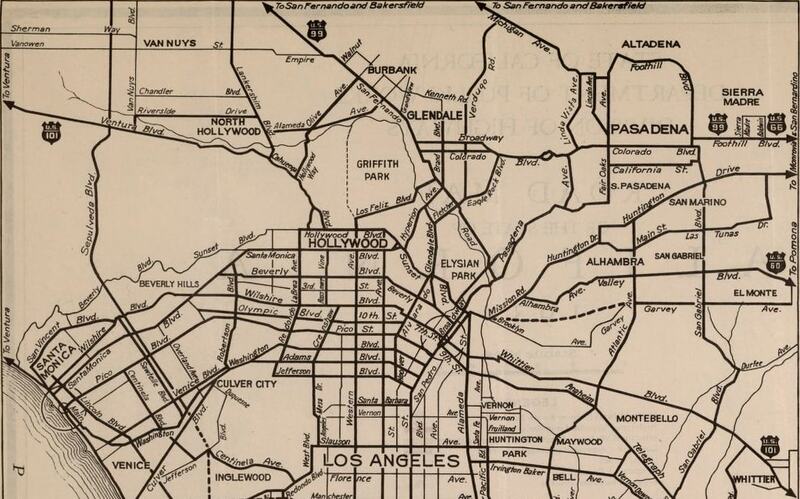 The other (smaller) bridge over the river was Macy (today's Cesar Chavez). 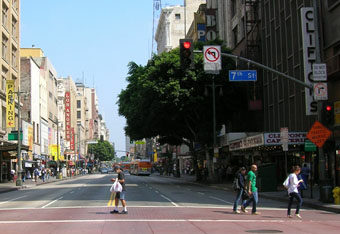 Just this side of the San Bernardino, a road branches off Macy and comes toward the camera, parallel to the Santa Ana. 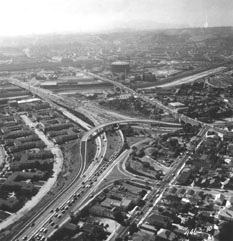 That is Pleasant Avenue; US 101 traffic was routed along Macy and Pleasant until these freeways were built. 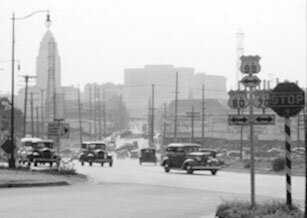 ​That was taken from the aforementioned Cesar Chavez bridge, which carried historic US 101. 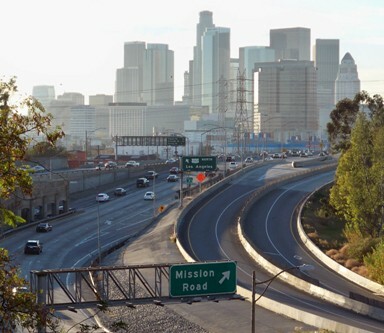 The downtown skyline provides a nice backdrop for the modern US 101 freeway in the middleground. last updated Apr. 21, 2016.